 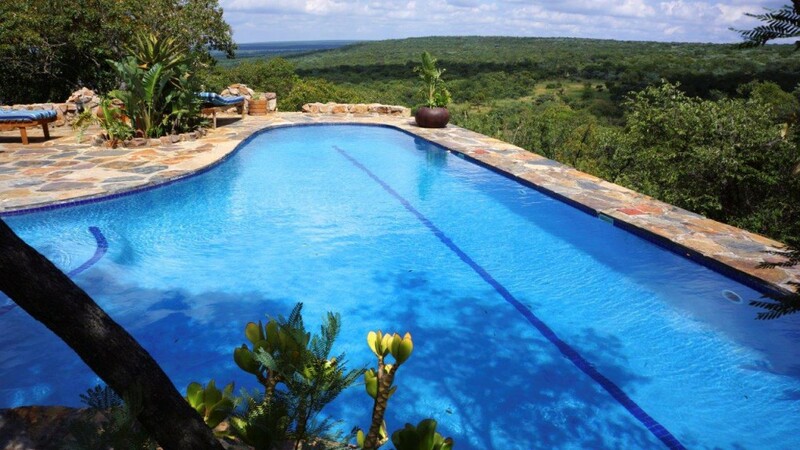 Ant’s Hill is hosted by a wonderful team who create an open and friendly atmosphere. 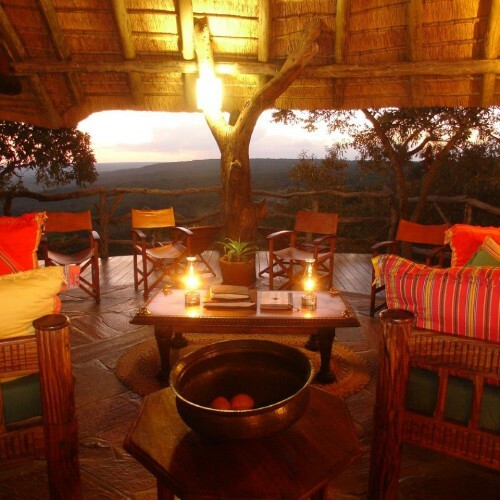 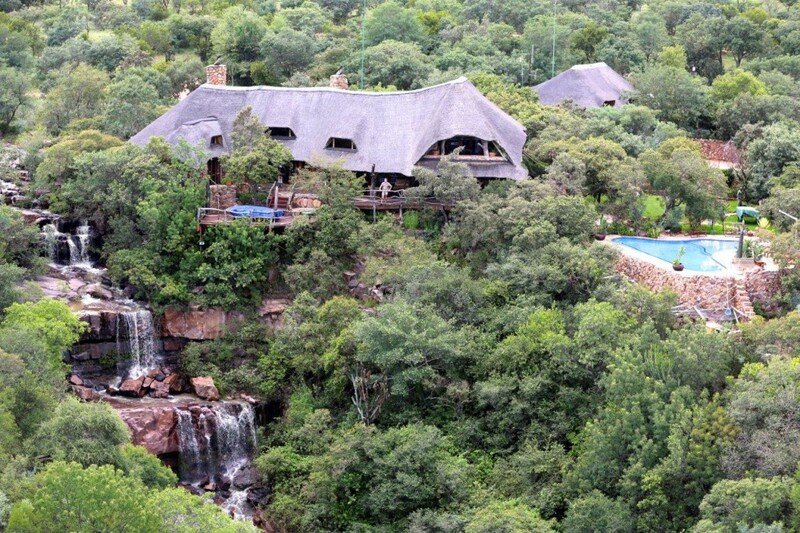 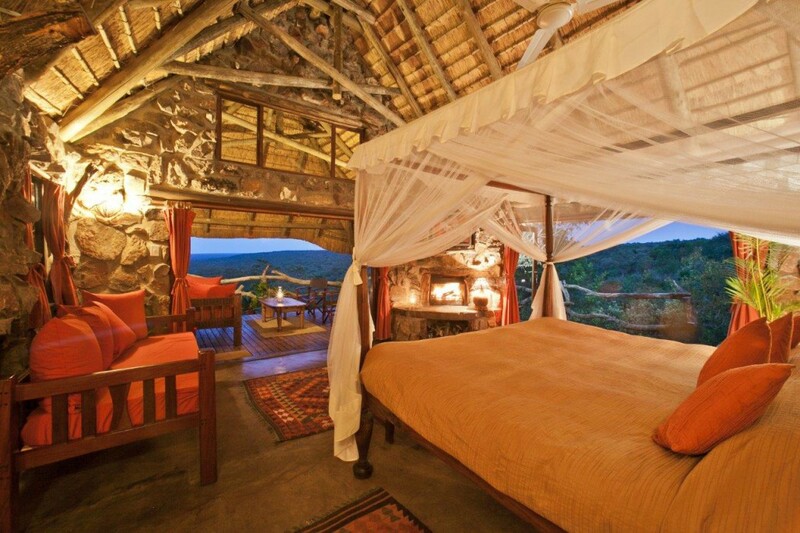 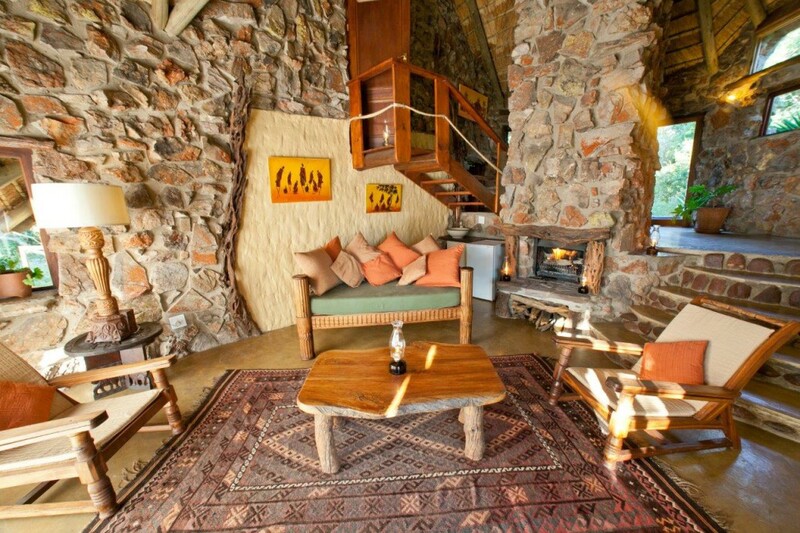 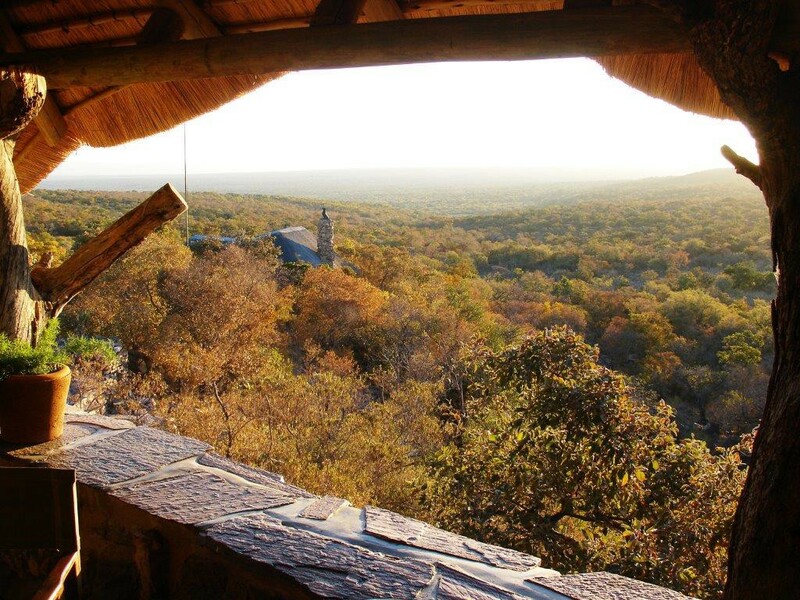 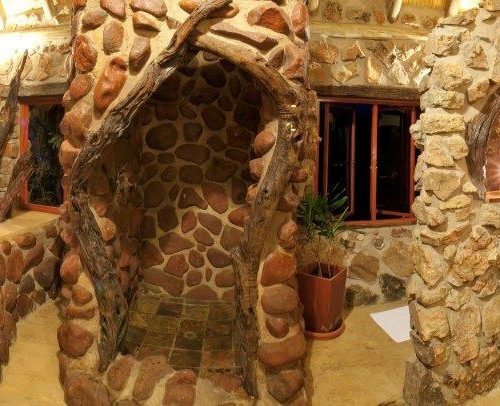 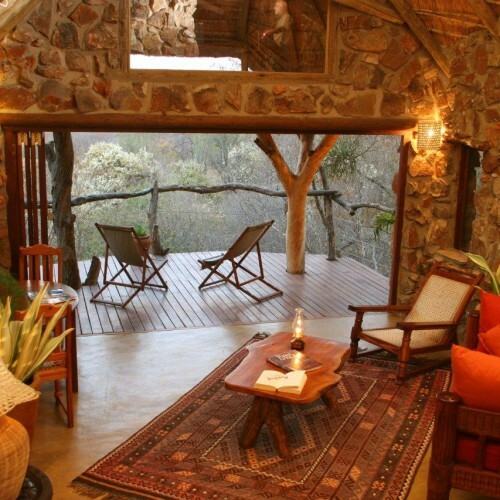 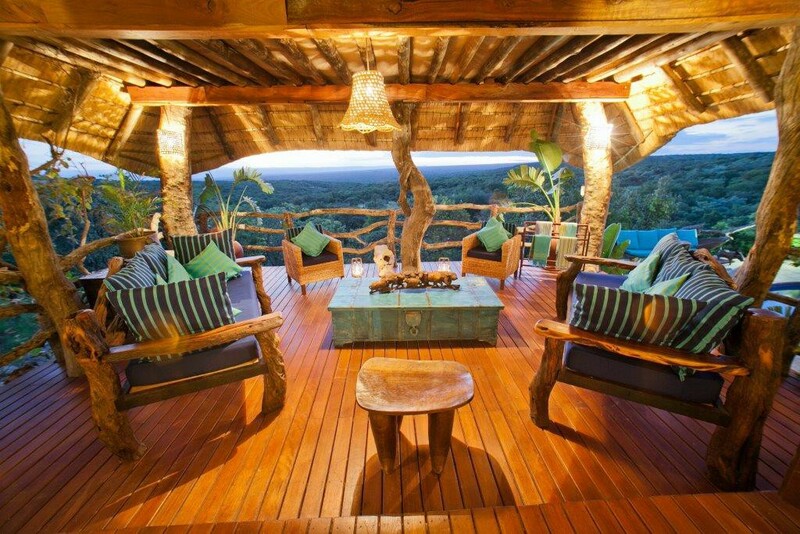 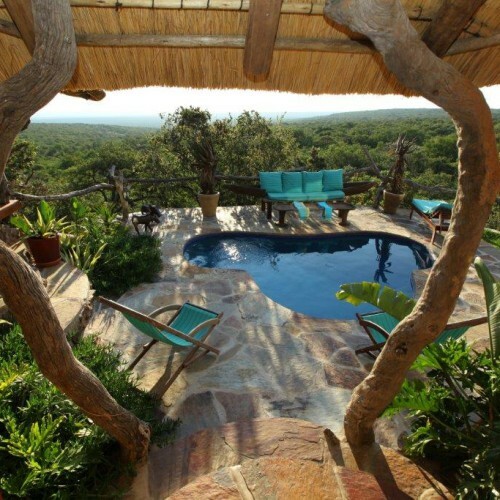 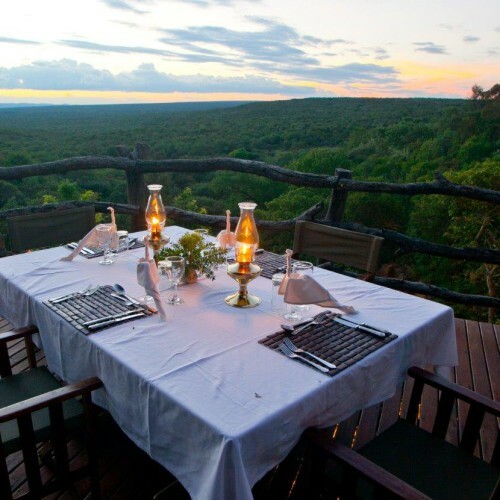 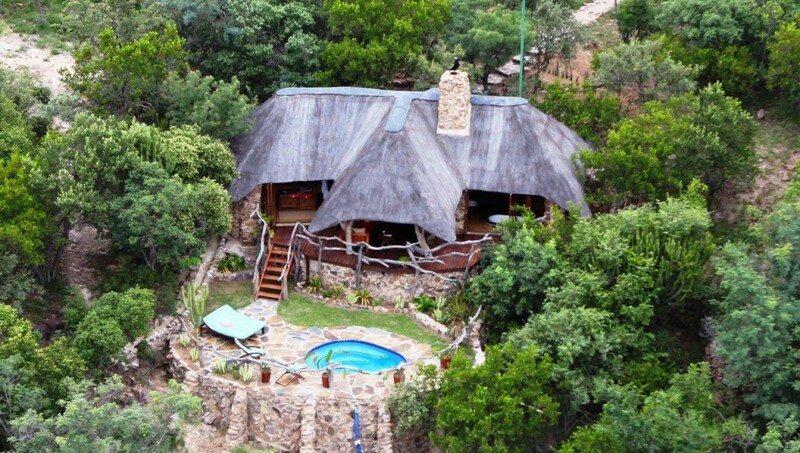 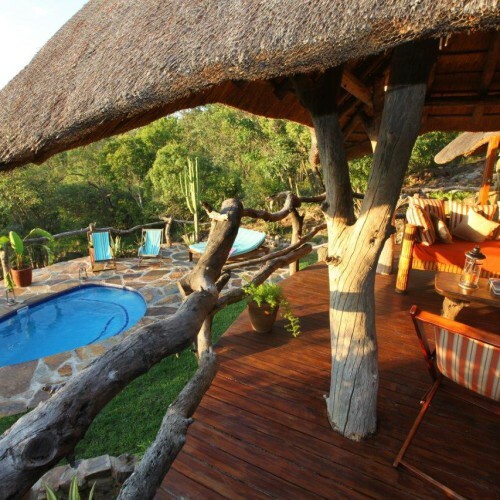 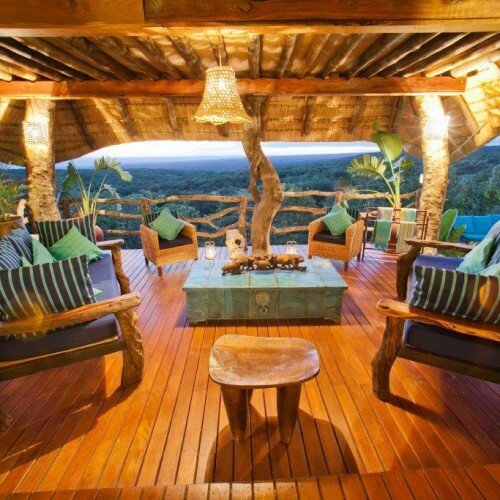 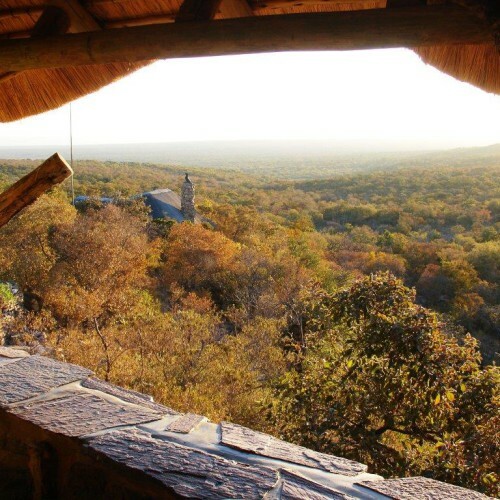 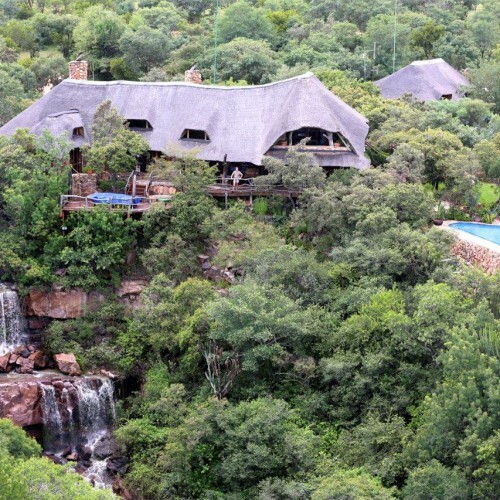 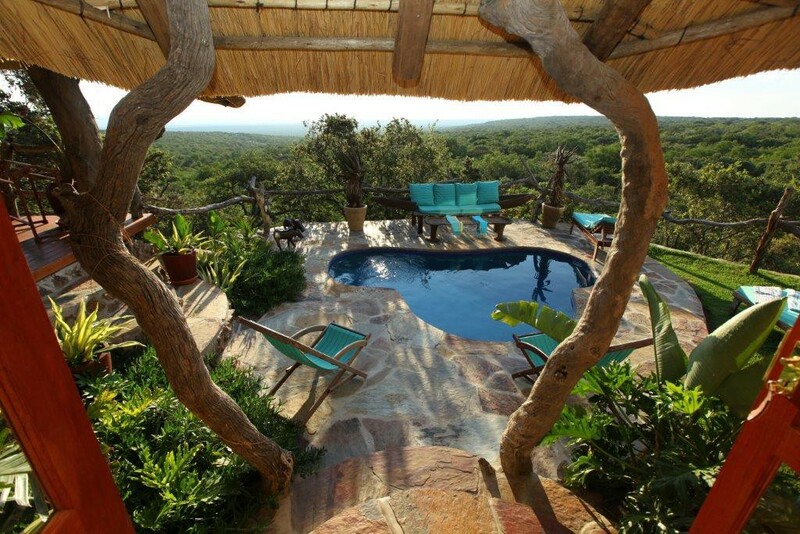 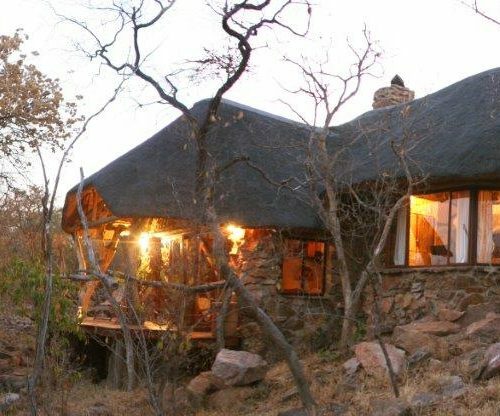 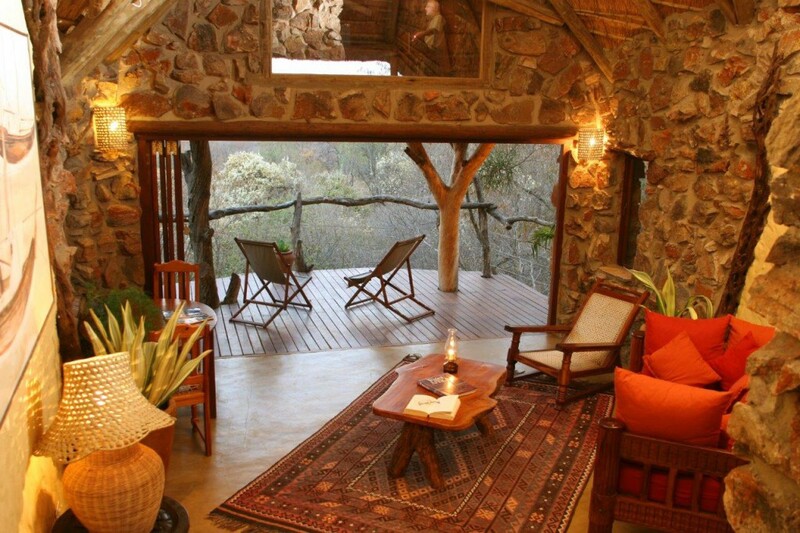 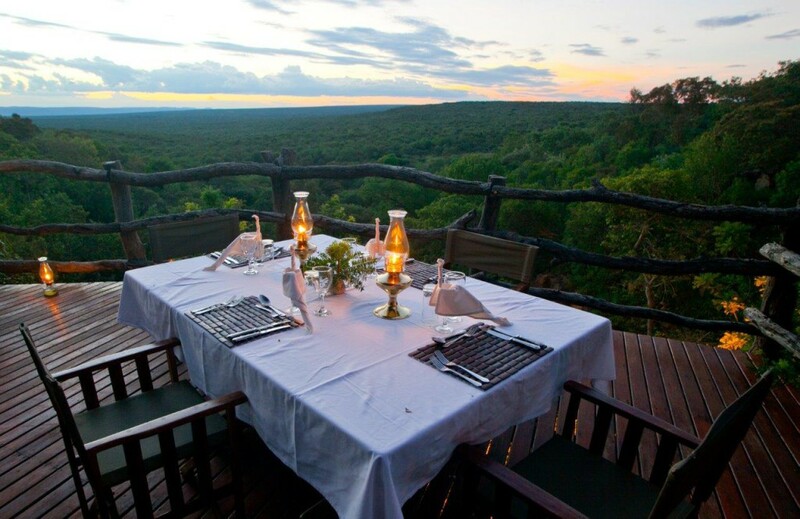 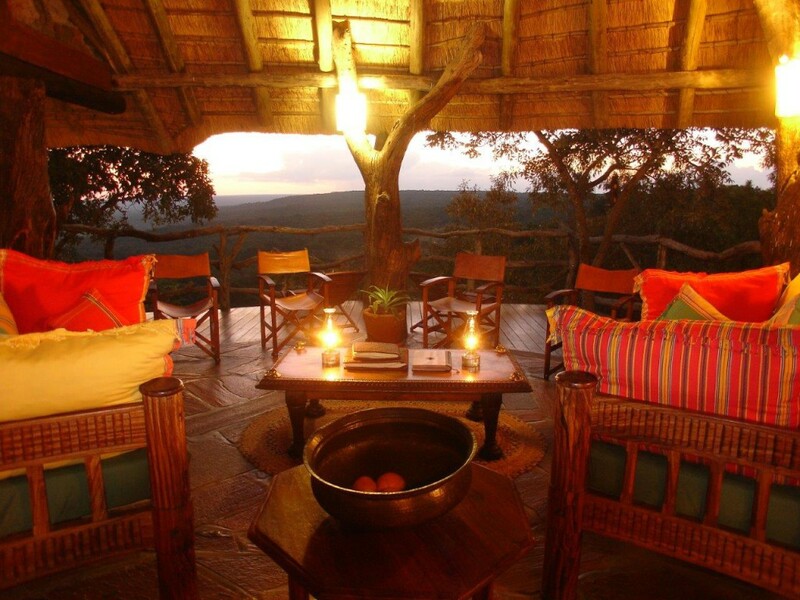 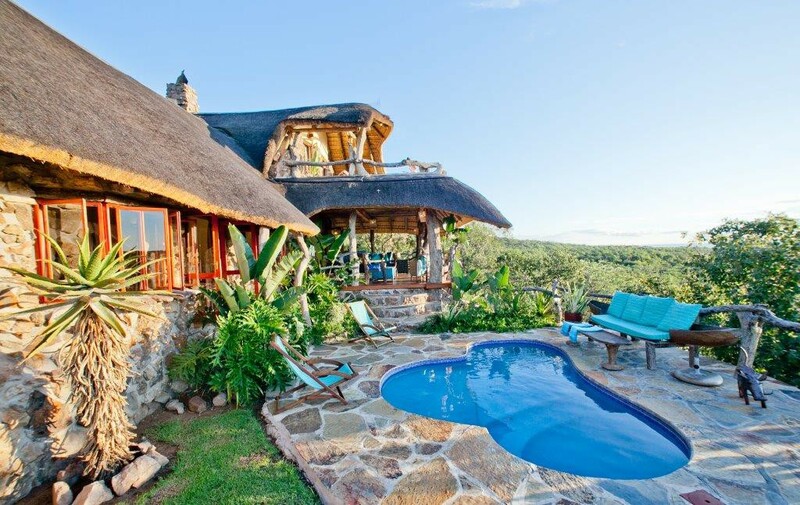 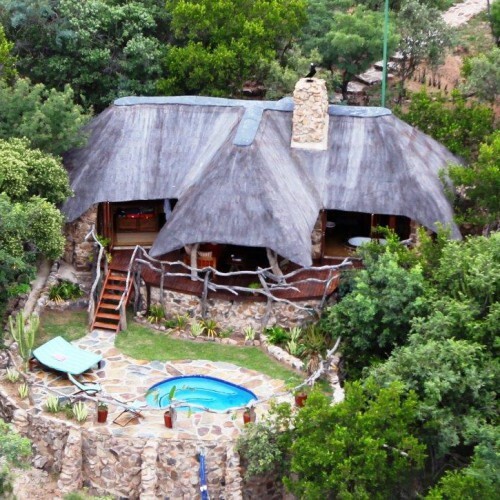 Built on the edge of a cliff, this bush home offers breath-taking views across the Waterberg. 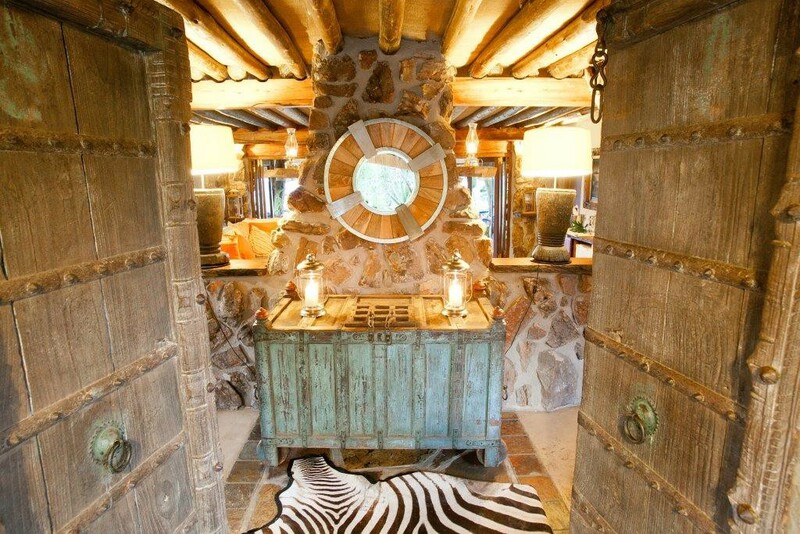 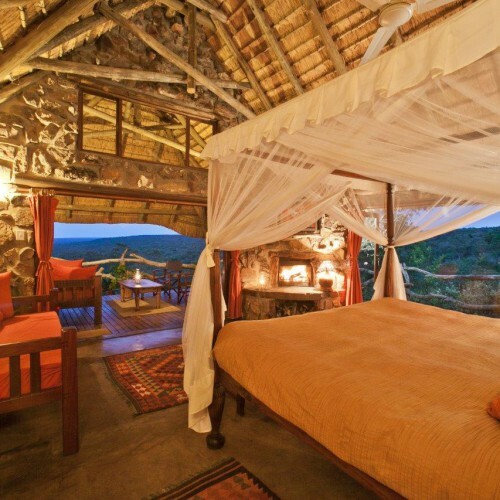 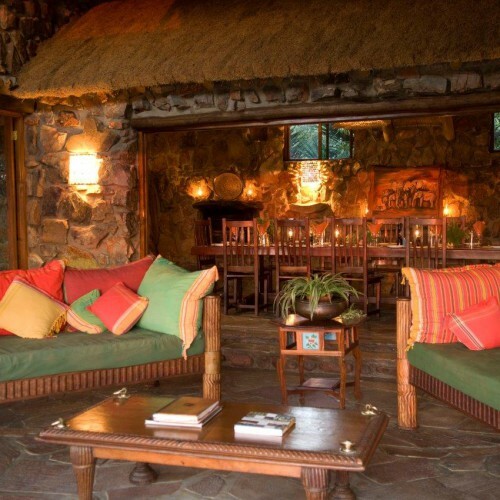 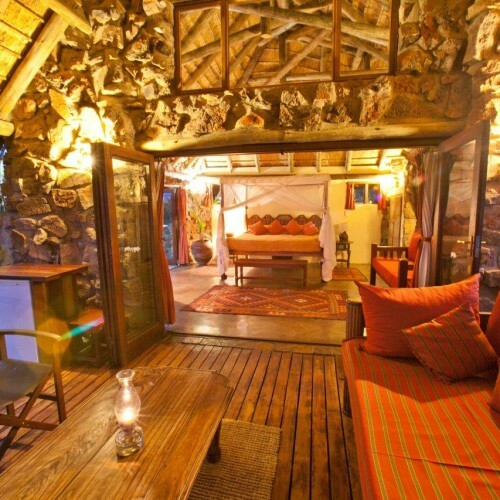 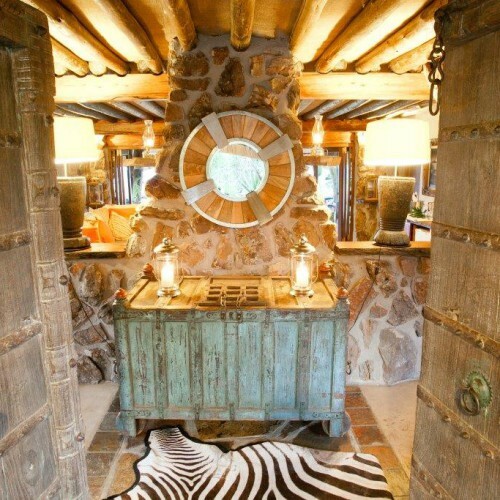 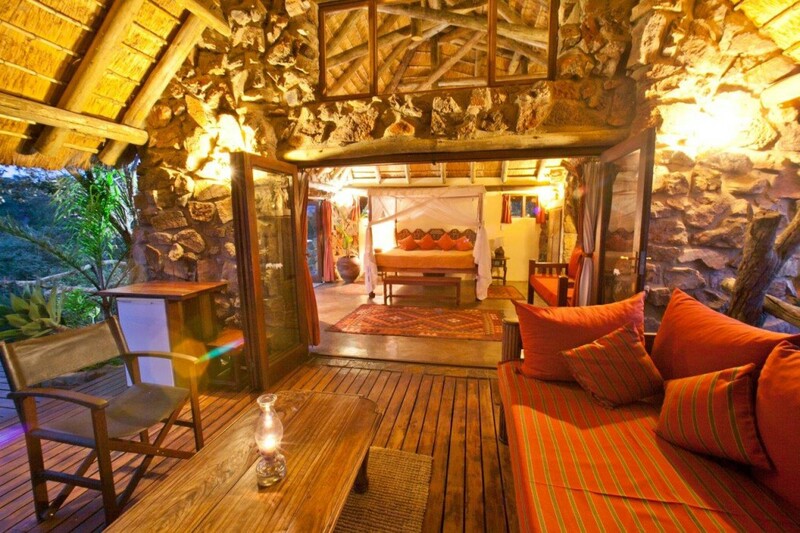 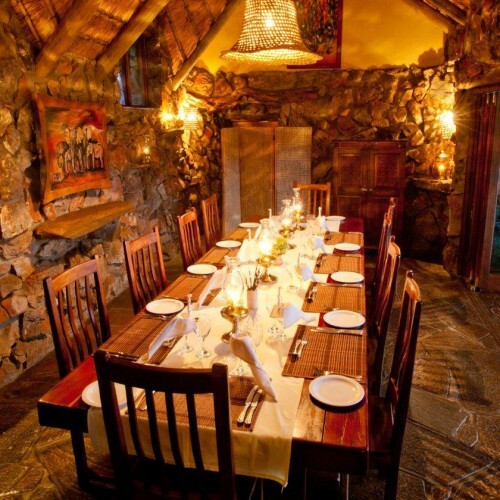 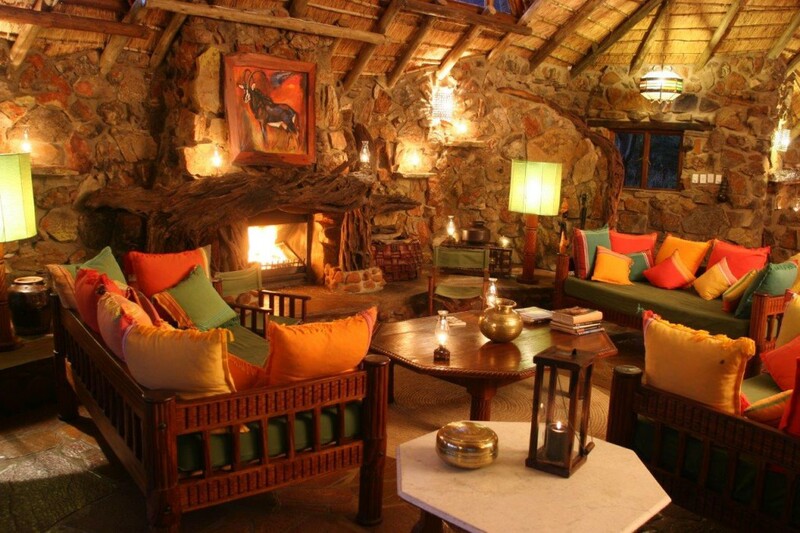 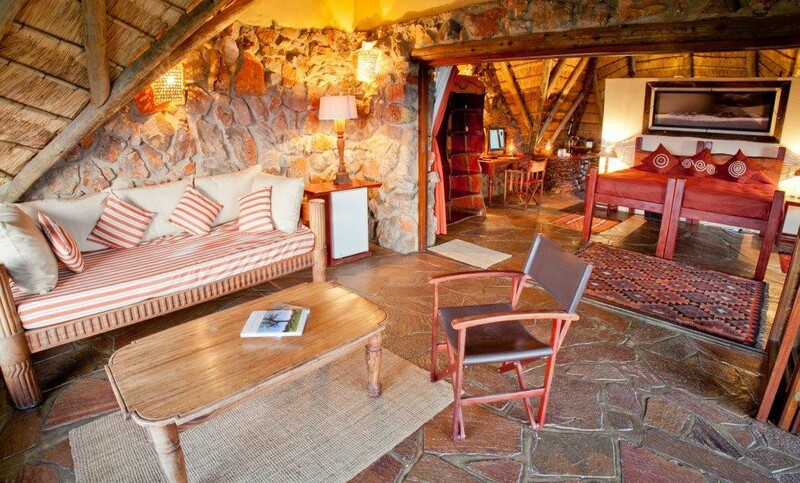 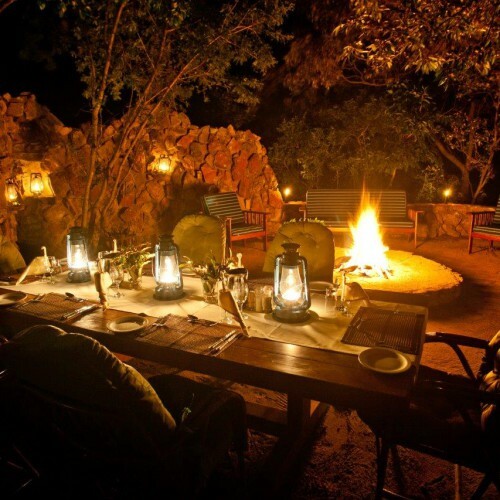 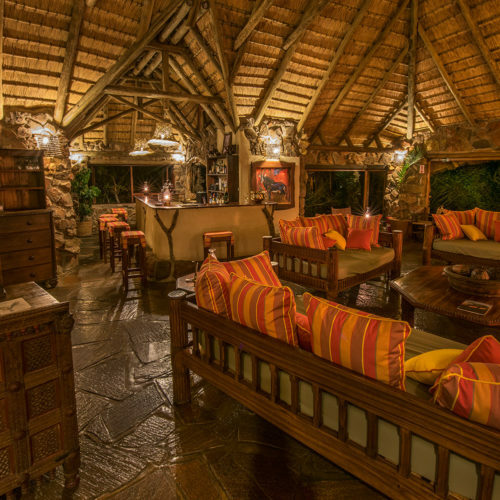 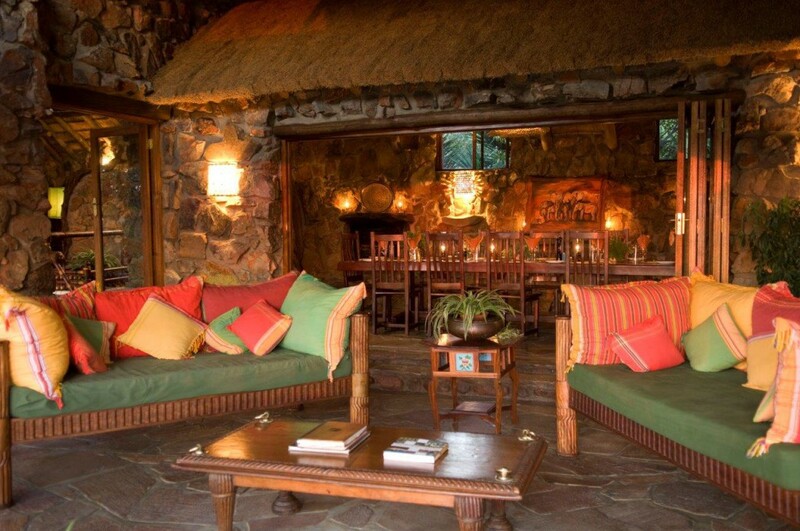 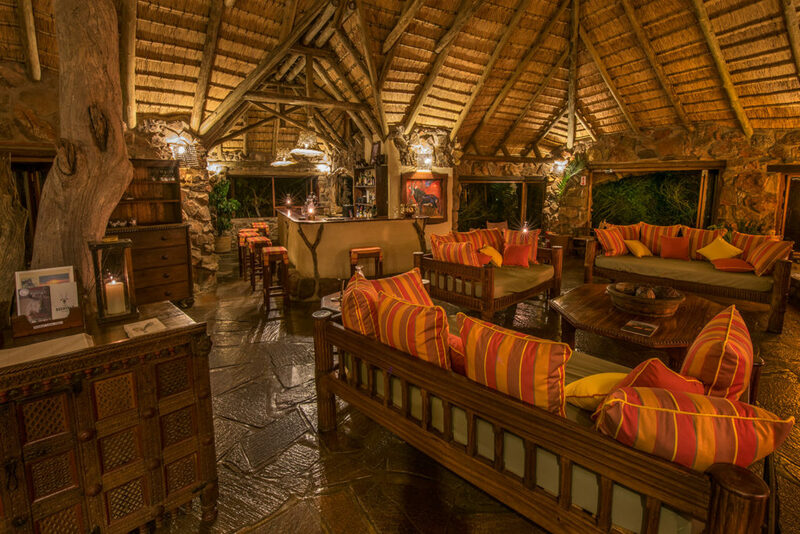 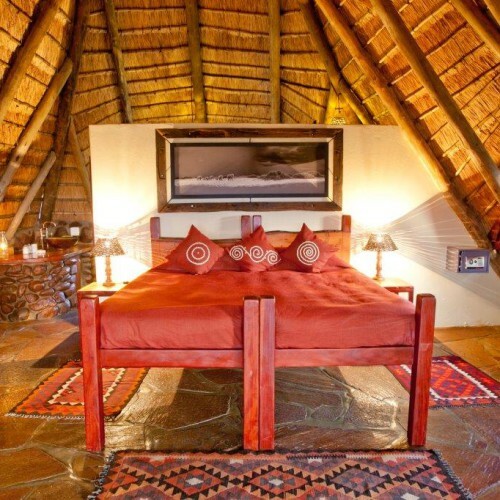 With spacious rooms and vast folding doors, the thatched lodge blends into the bush, while exotic furniture and brightly coloured African fabrics make it both sophisticated and comfortable. 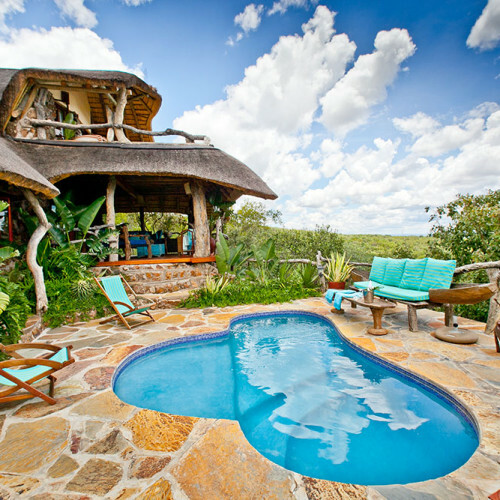 Each cottage is uniquely designed and the individual bathrooms are spectacular, offering guests sunken baths and waterfall showers. 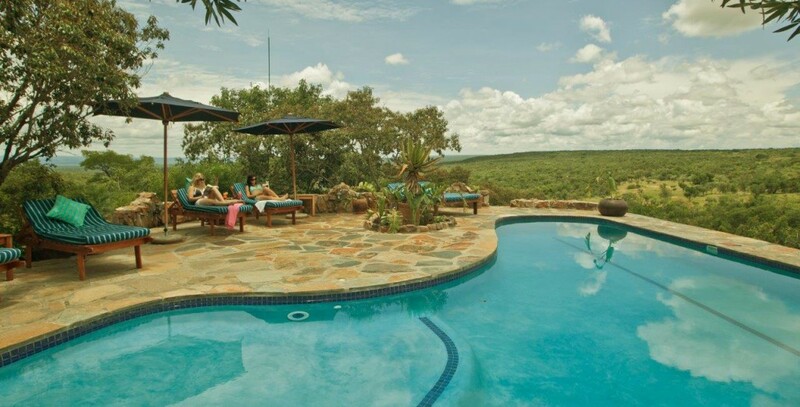 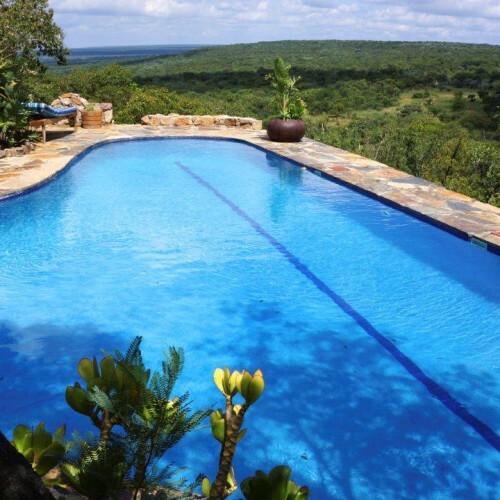 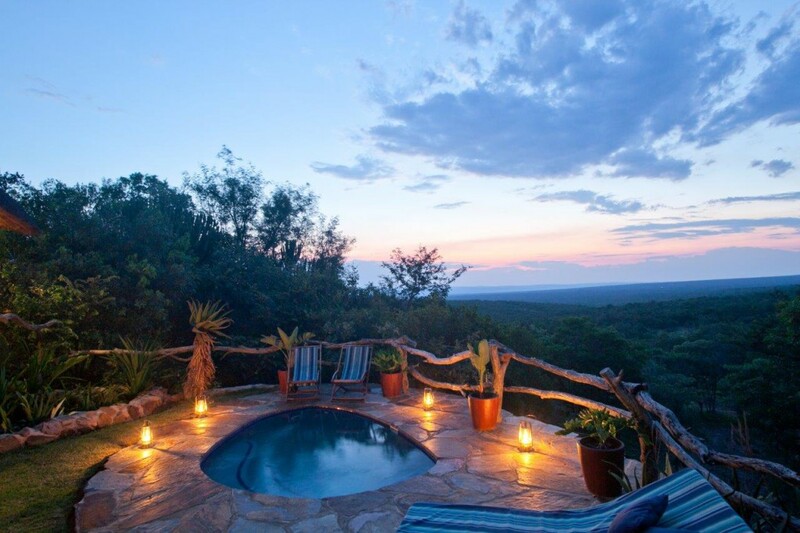 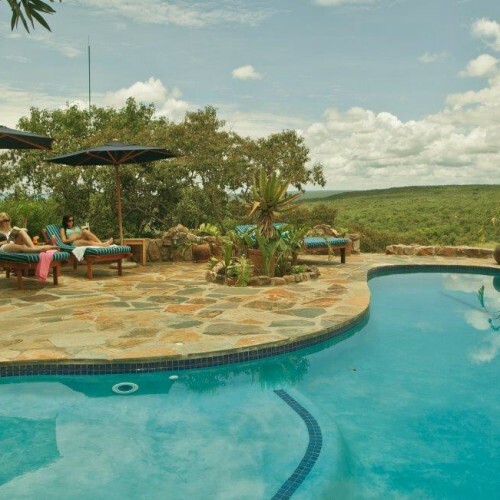 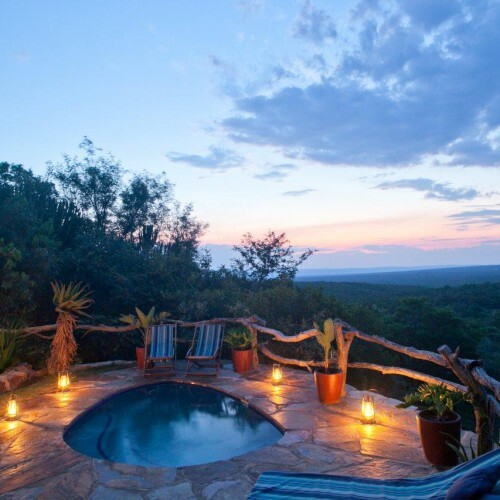 Set in boulders on the edge of the cliff, the heated swimming pool offers fabulous views across reserve, enticing you to relax there for hours. 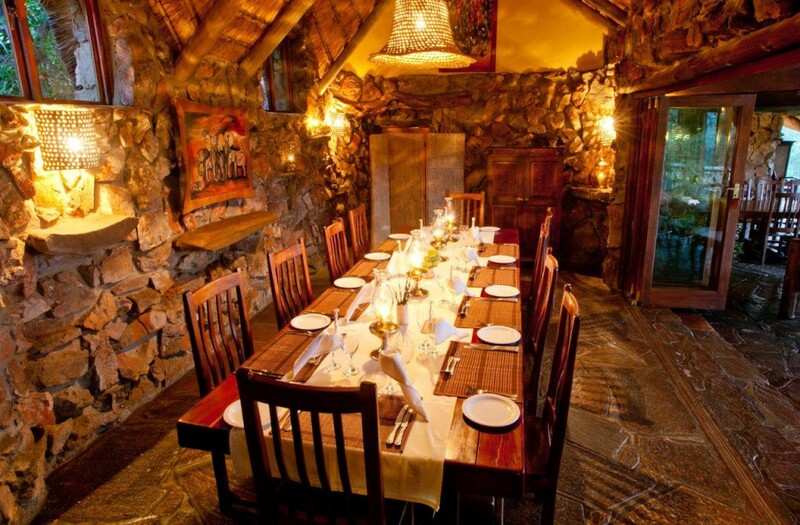 Ant’s Hill can cater for 16 guests and can be booked non-exclusively or exclusively to one group at a time. 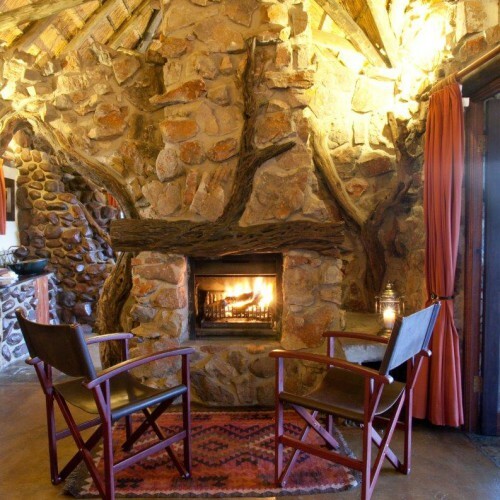 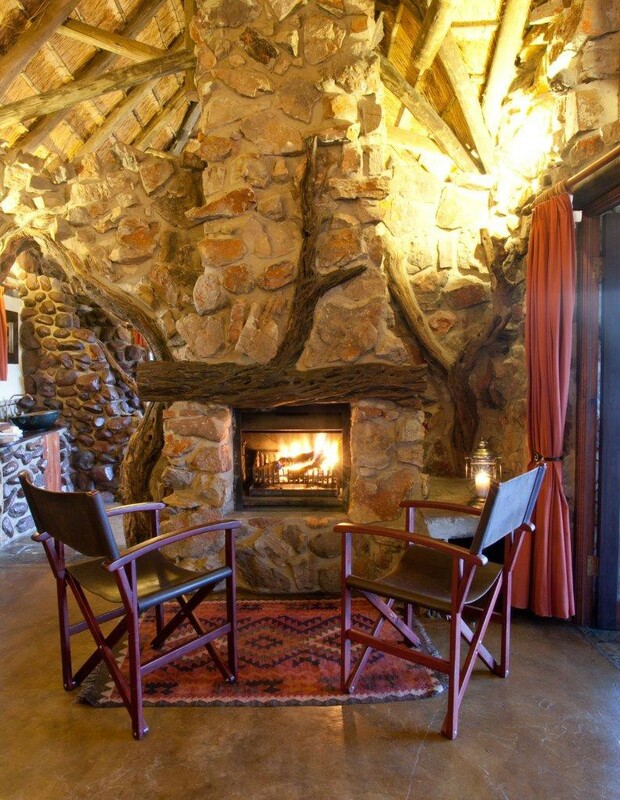 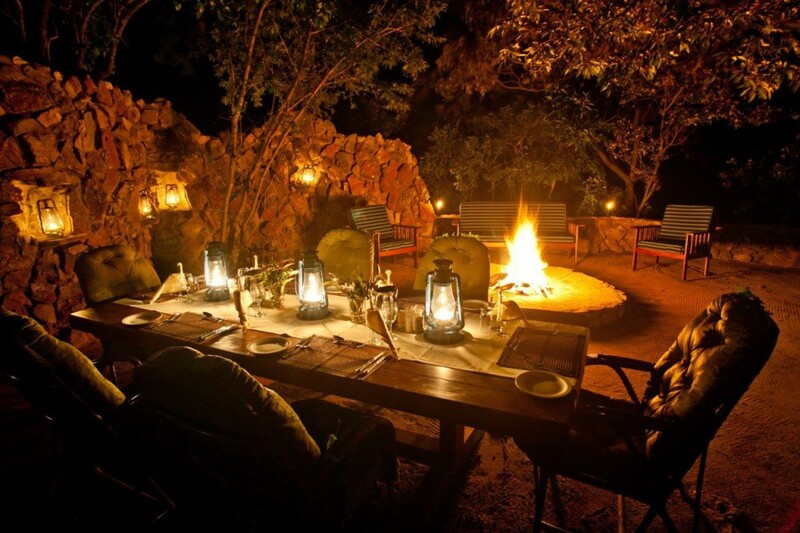 The main lodge boasts a spacious living area and dining room, both with fireplaces. 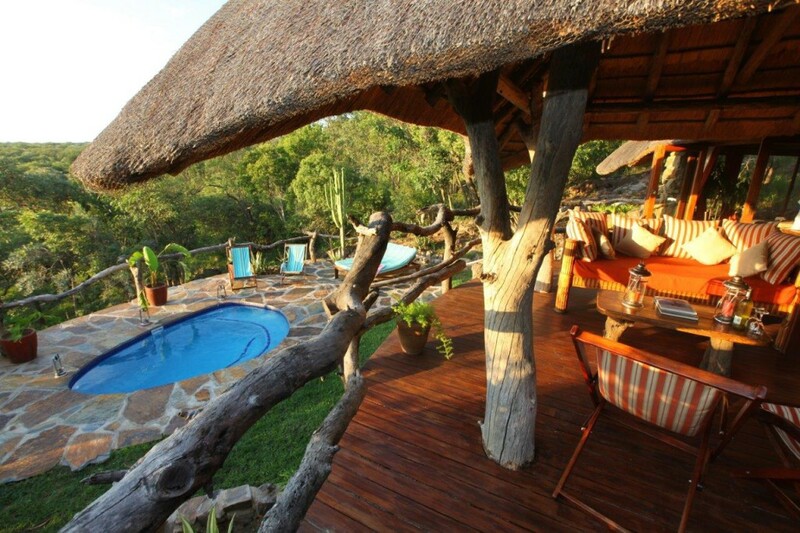 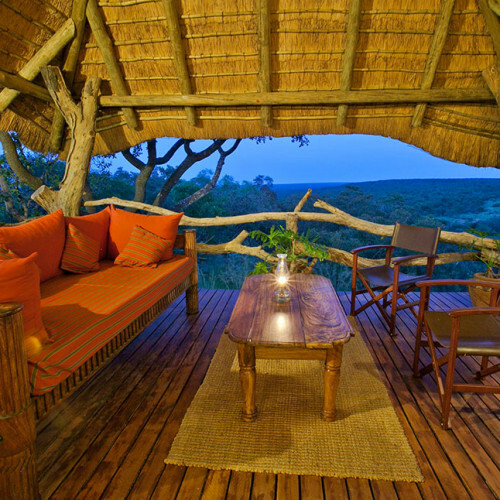 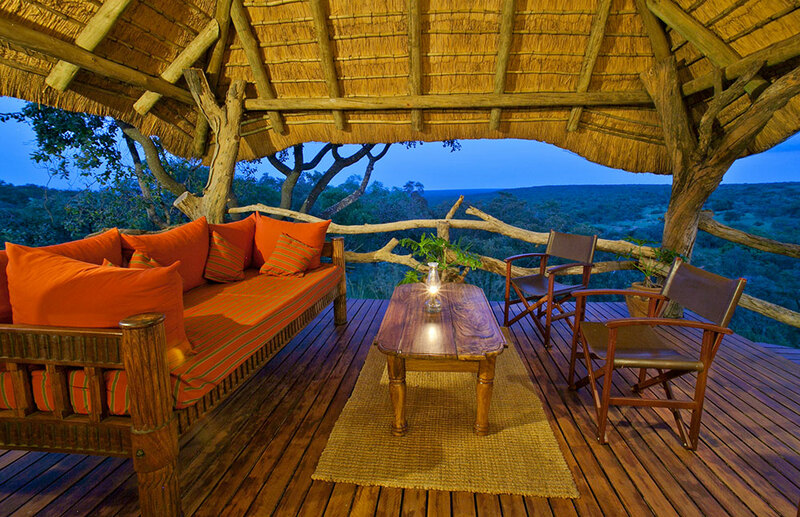 A large veranda and deck overhang the gorge so are ideal for early morning breakfasts and evening sundowners. 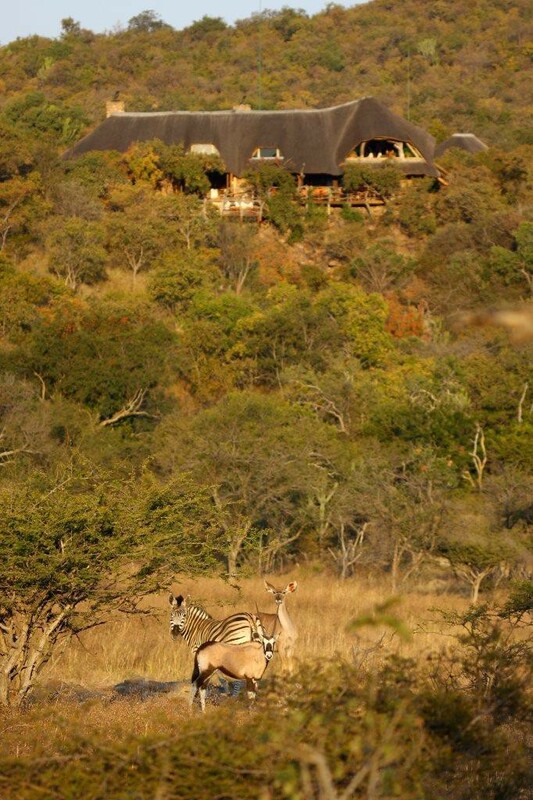 To top it all Ant’s Hill overlooks a waterhole frequented by a variety of game. 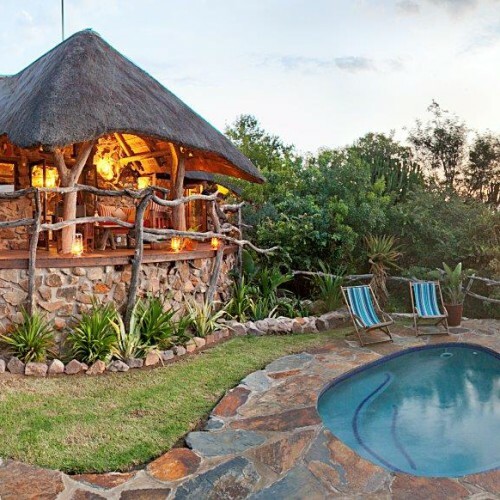 Ant’s Hill has a variety of cottages ranging from standard to superior deluxe, they are scenically appointed and each cottage has been creatively designed to suit all types of travelers from Families to honeymooners and their varying budgets, scroll down for more details on each cottage and take your pick. 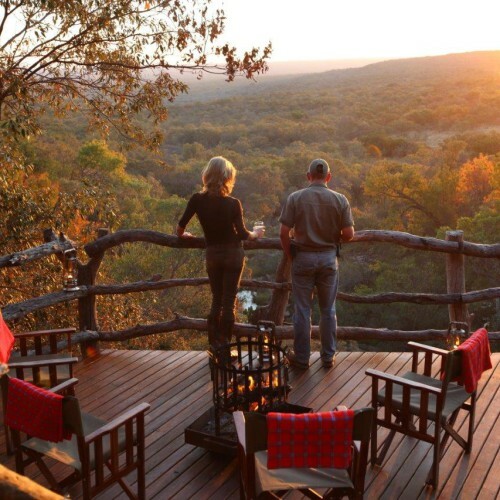 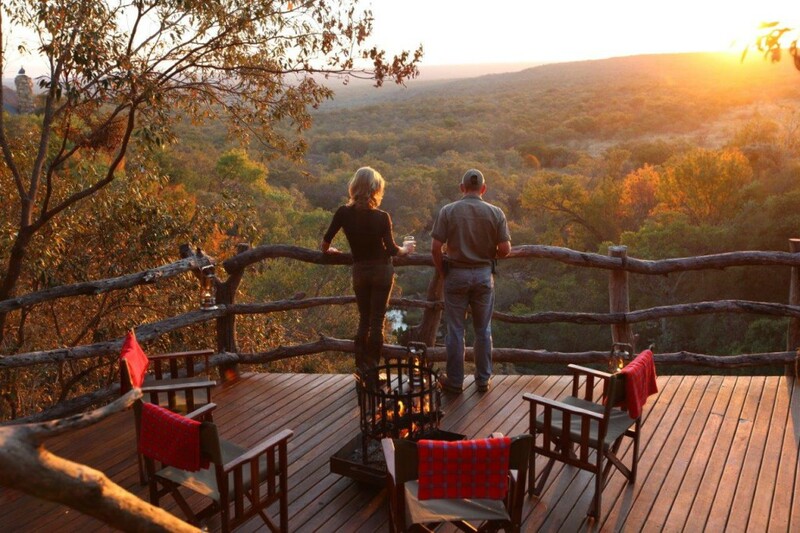 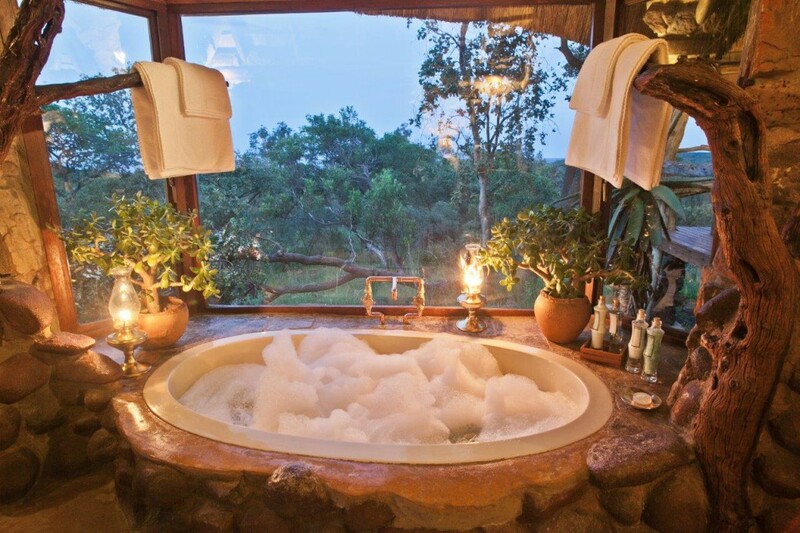 A superior deluxe cottage – Built with luxury and privacy in mind, our World’s View cottage is the ultimate bush retreat. 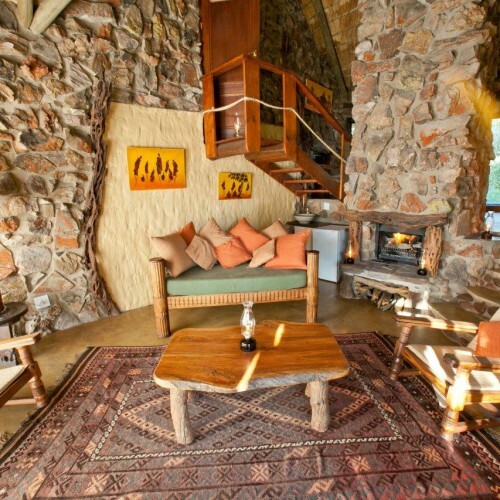 It is perfect for families of up to five people or two couples travelling together. 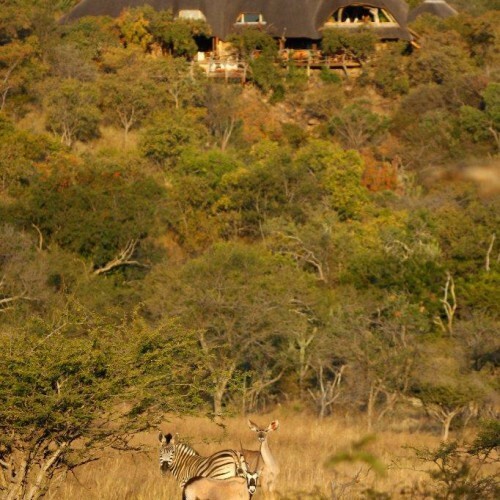 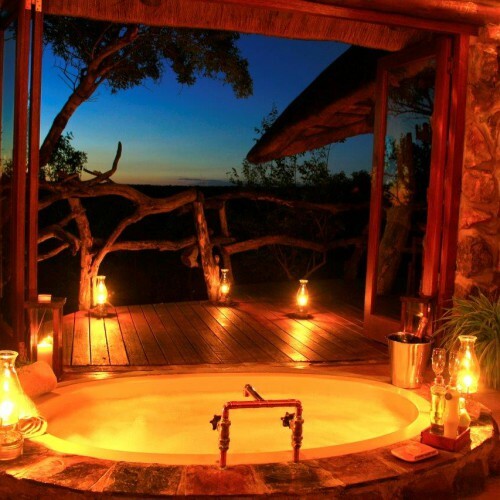 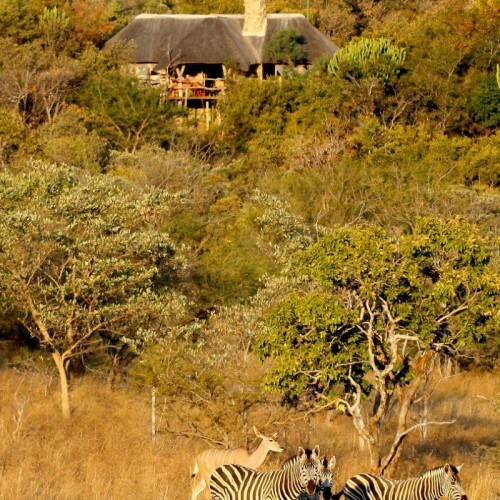 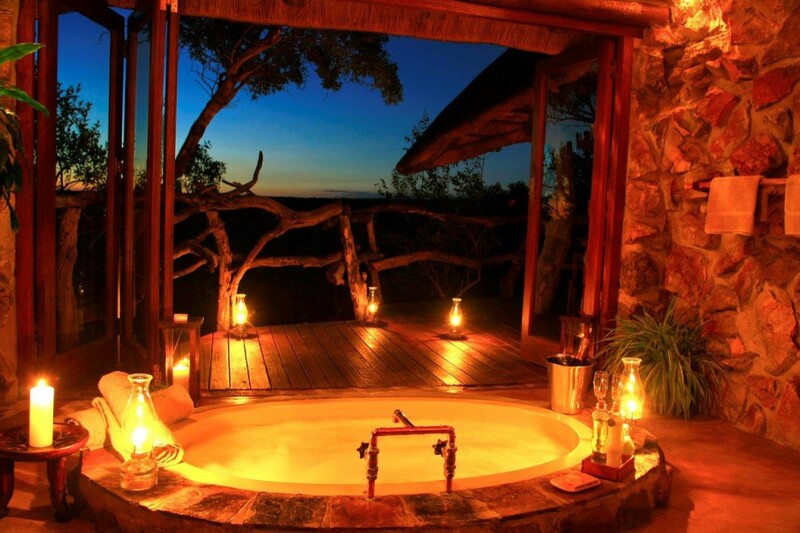 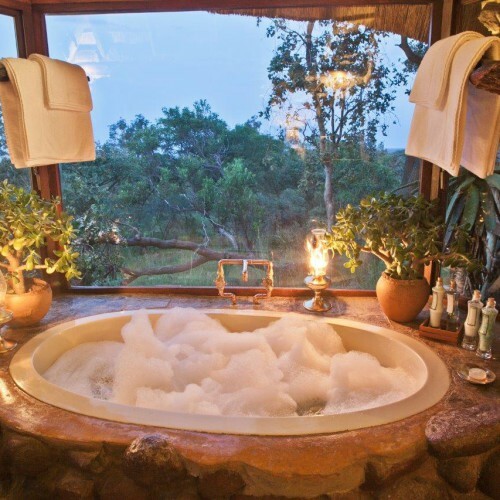 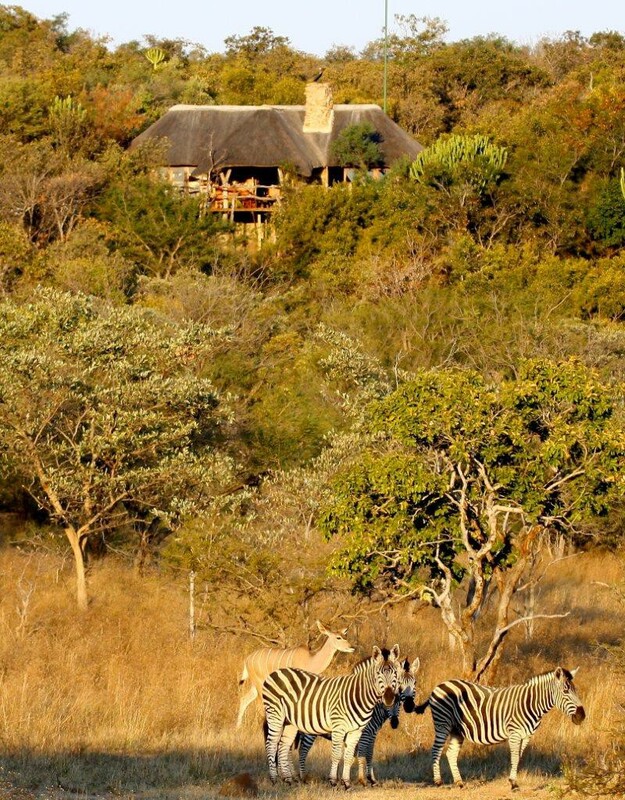 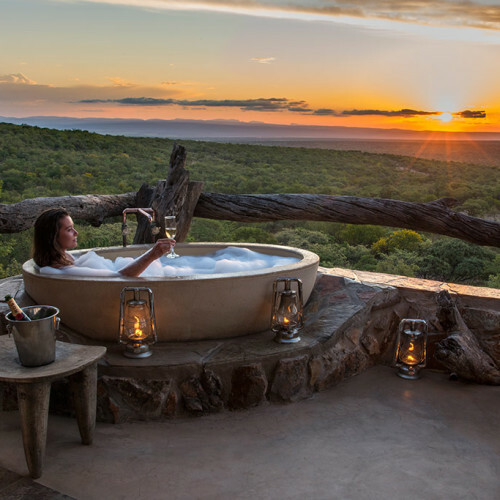 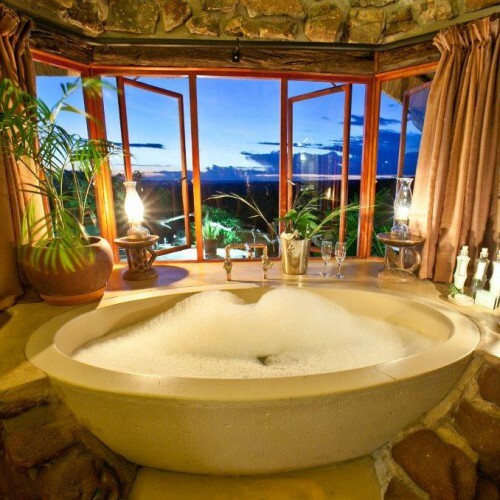 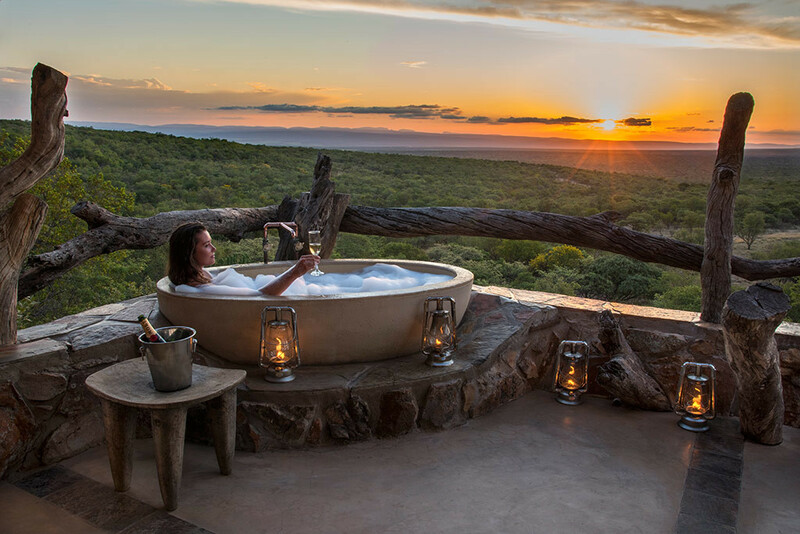 The en-suite double bedroom upstairs with bath and shower opens up on to a private balcony with an outside bath overlooking the stunning valley below, where giraffe, zebra, kudu and eland can often be seen wandering. 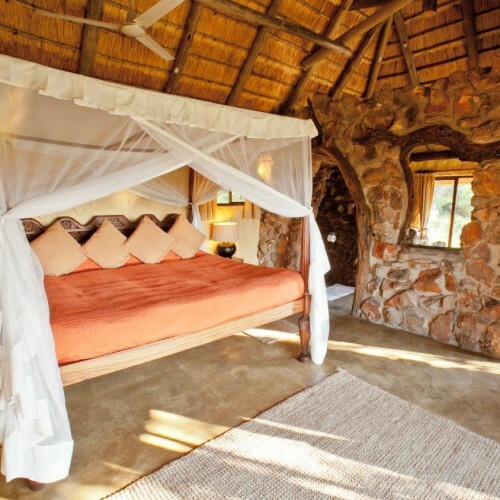 The spacious bedroom downstairs opens on to the private pool, can be either a twin, double or triple and has an en-suite bathroom featuring a bath with a view, a shower and an outside waterfall shower. 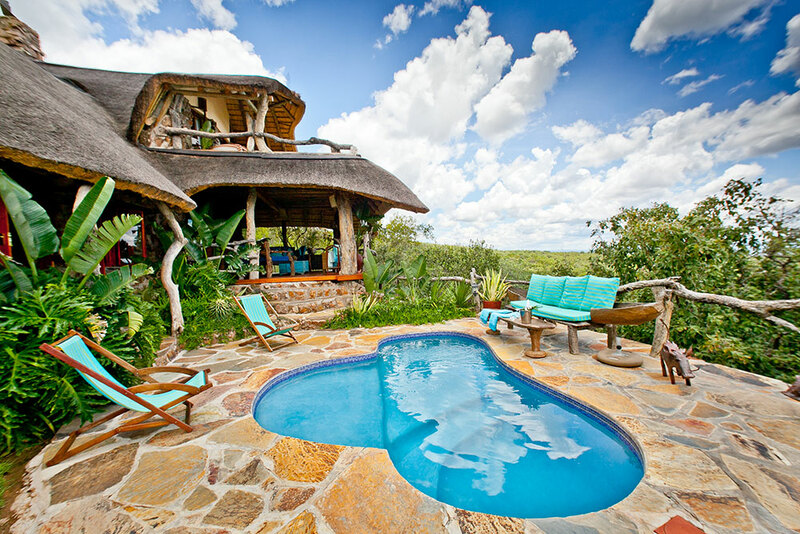 There is a covered veranda with comfortable day beds outside for relaxing during the heat of the day, leading to the pool area with sunbeds. 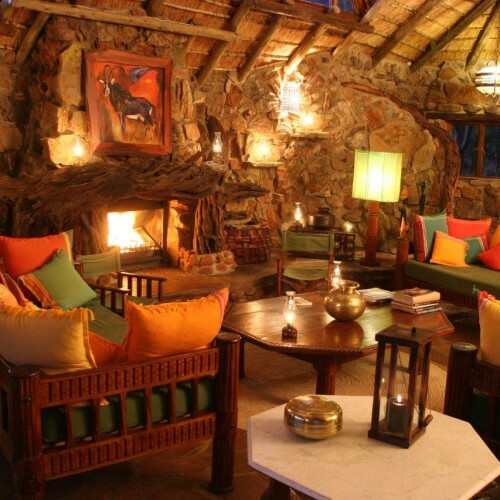 On chilly winter evenings one can cosy up next to the open fire in the sitting room with a glass of wine from the mini-bar. 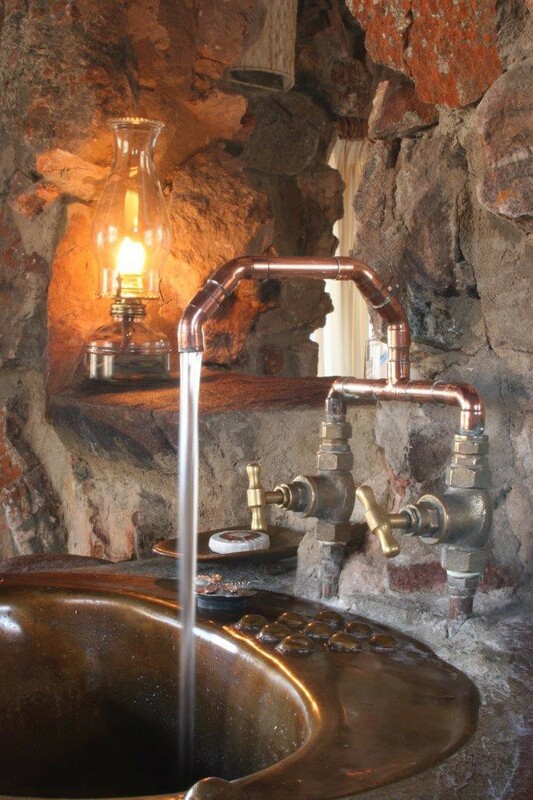 Tea and coffee facilities are also available. 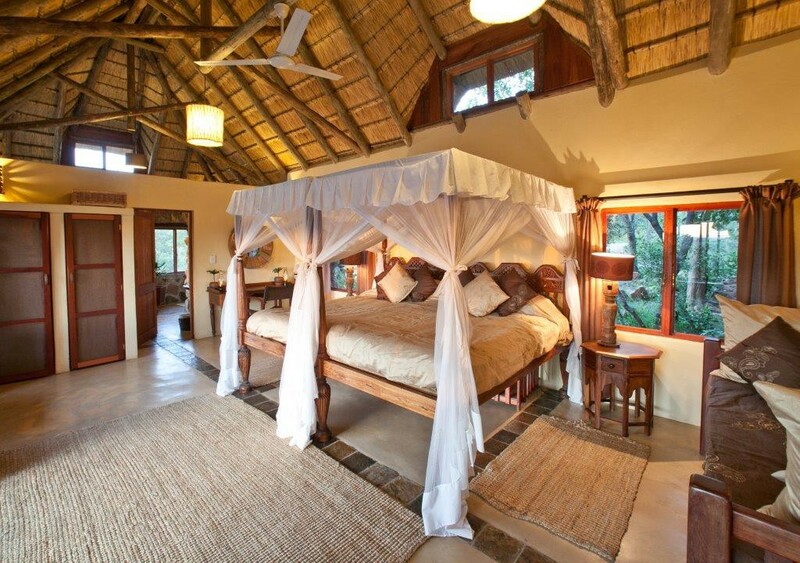 World’s view is based on a cottage rate up to 4 people, extra beds are available at an additional cost. 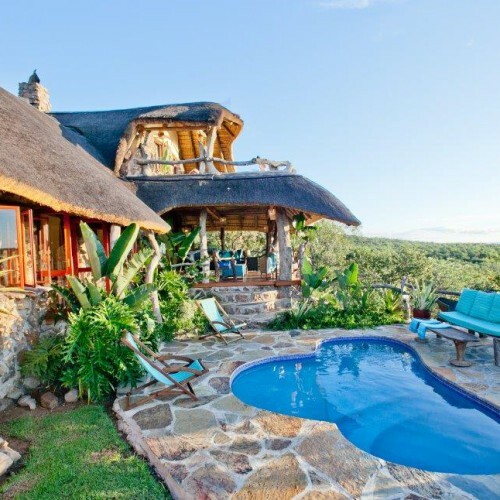 A superior deluxe cottage – secluded and private, this luxury cottage is perfect for honeymooners or couples looking for a romantic getaway, but is large enough to accommodate beds for two children, sharing with their parents. 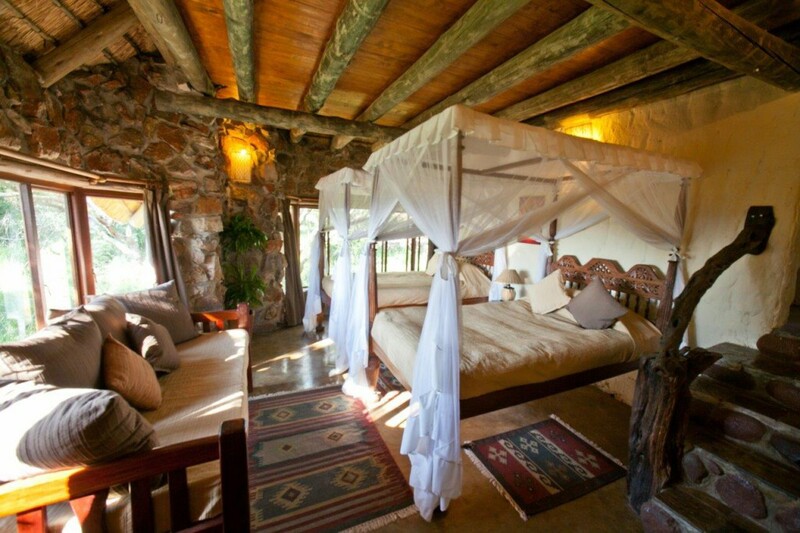 The King-size four poster bed has stunning views across the valley with French doors opening up onto the outside deck and verandah. 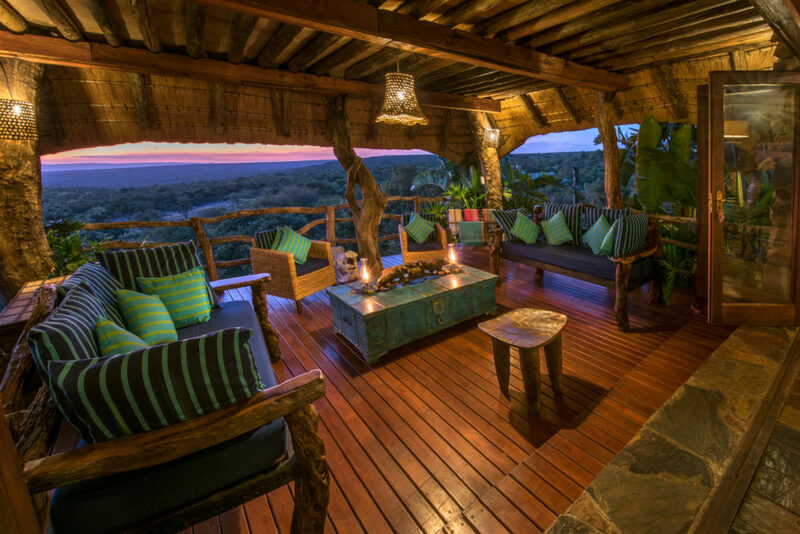 The verandah features a carved day bed for relaxing in the shade, wooden steps take you down to a private garden and plunge pool. 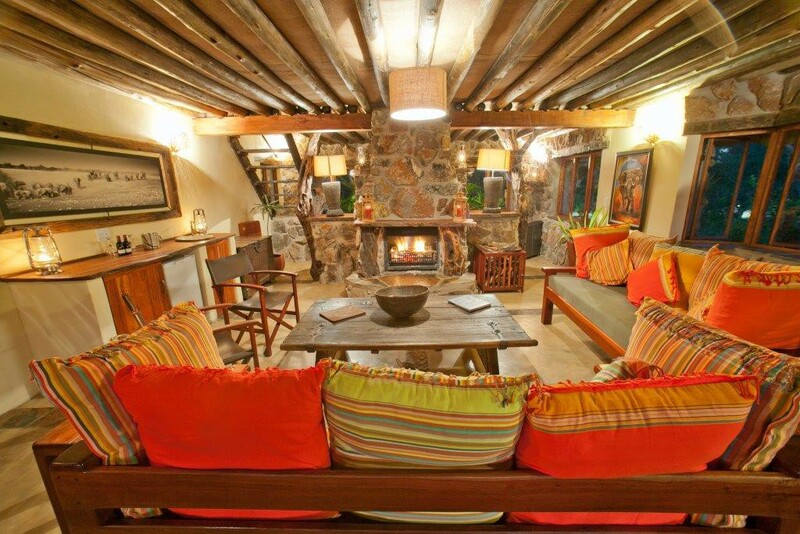 For those winter evenings there is a cosy seating area inside with an open fire. 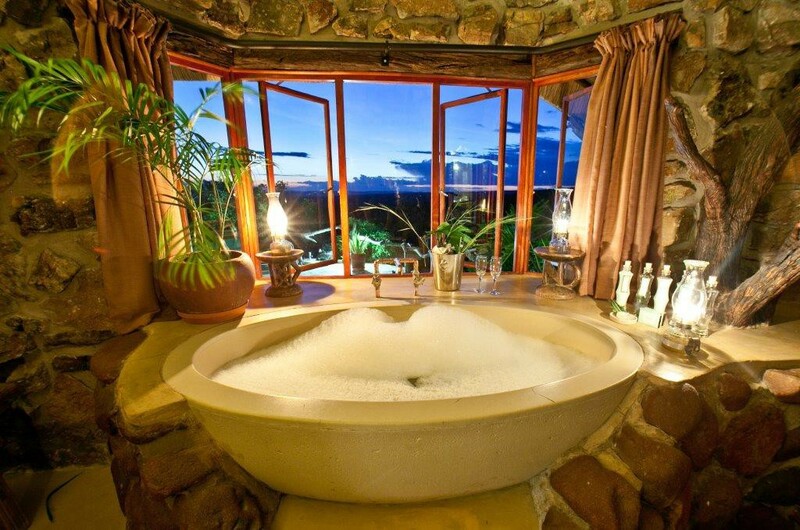 The open plan en-suite bathroom features a sunken bath and French doors which open onto the deck to bring the outside indoors. 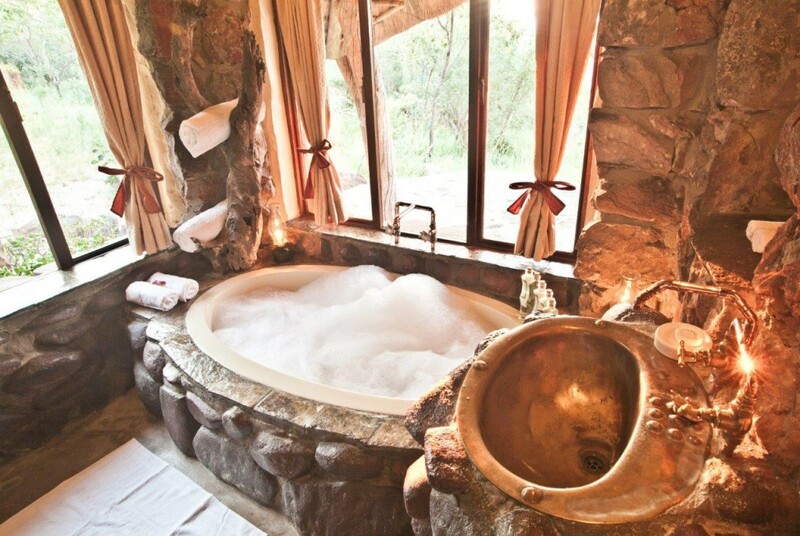 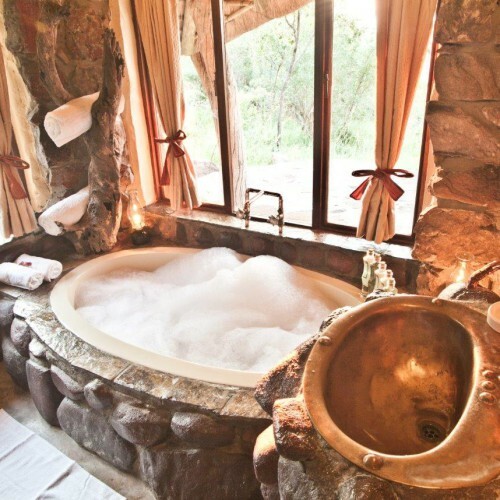 There is a waterfall shower inside and an outside shower overlooking the valley. 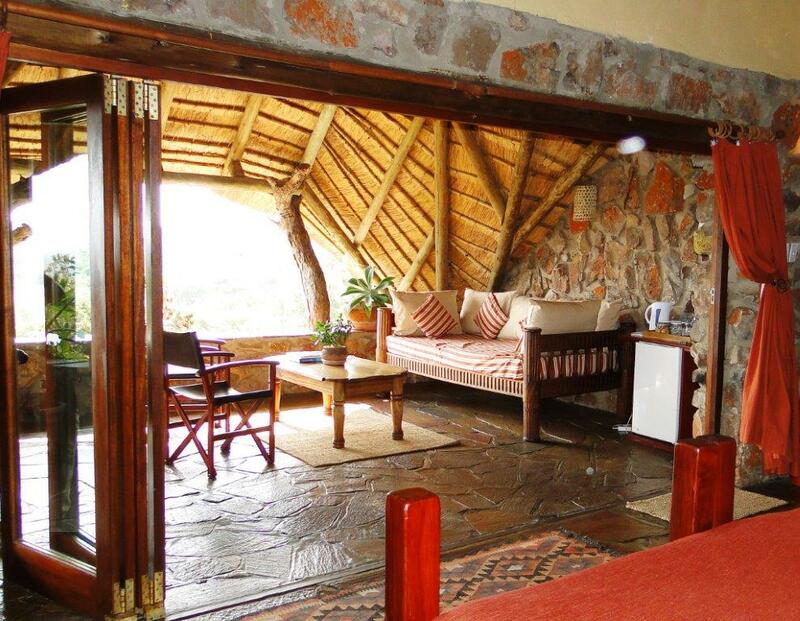 The room has a mini bar with tea and coffee making facilities. 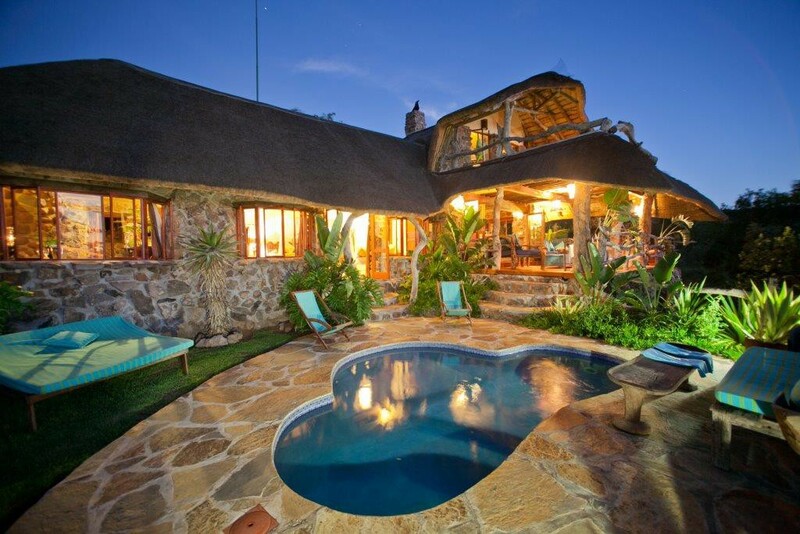 A deluxe cottage – Ideal for families of up to six people, this is a home away from home. 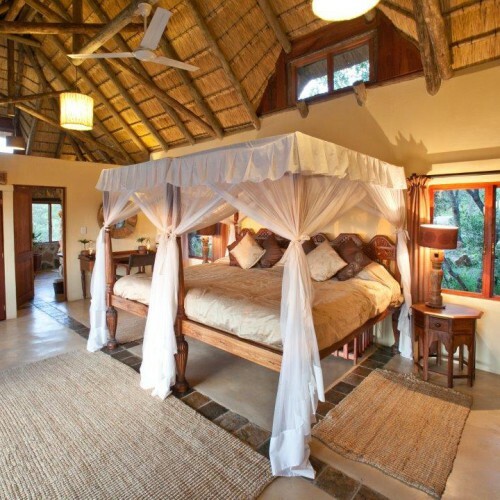 The spacious en-suite master bedroom features a king-size four poster bed and open plan bathroom including a bath with a view and waterfall shower. 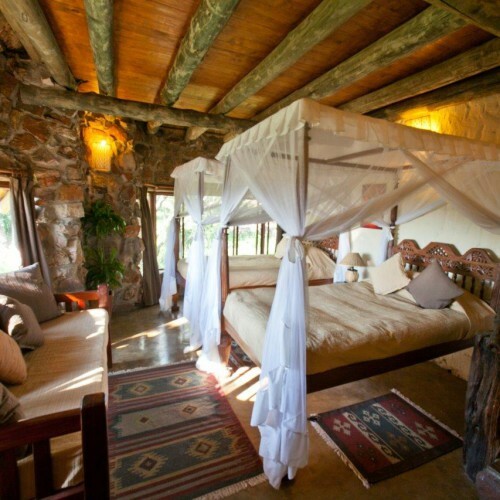 The second bedroom, a twin with two four poster beds can be converted into a double giving you a king-size bed, should there be two couples travelling together. 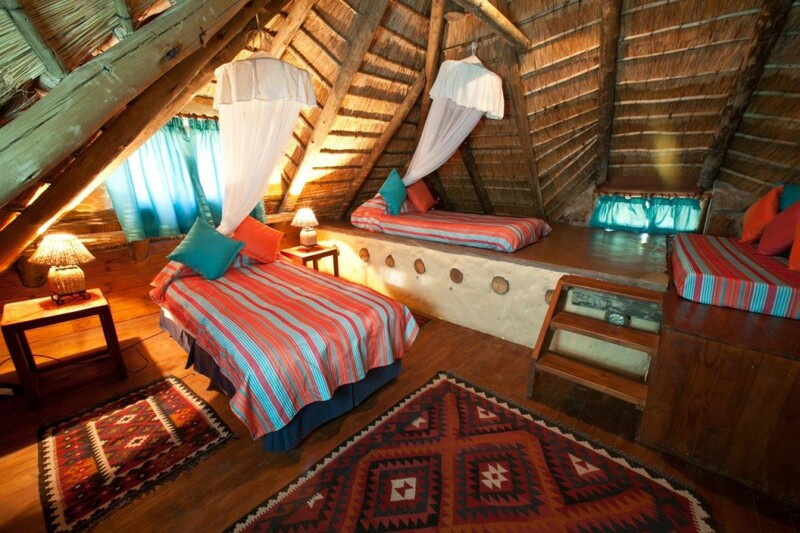 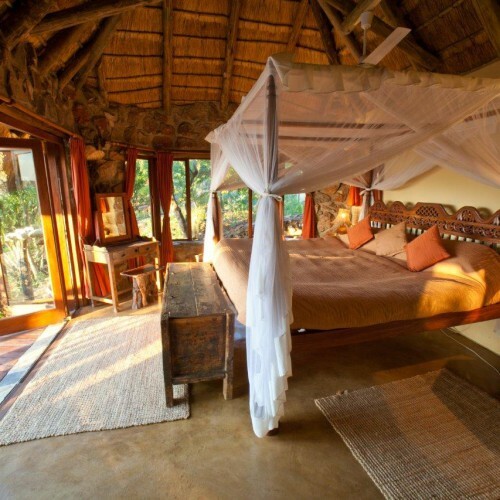 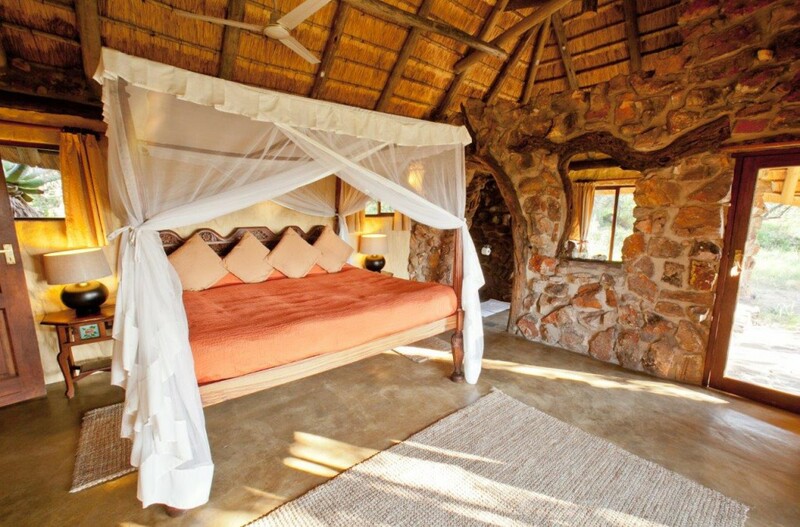 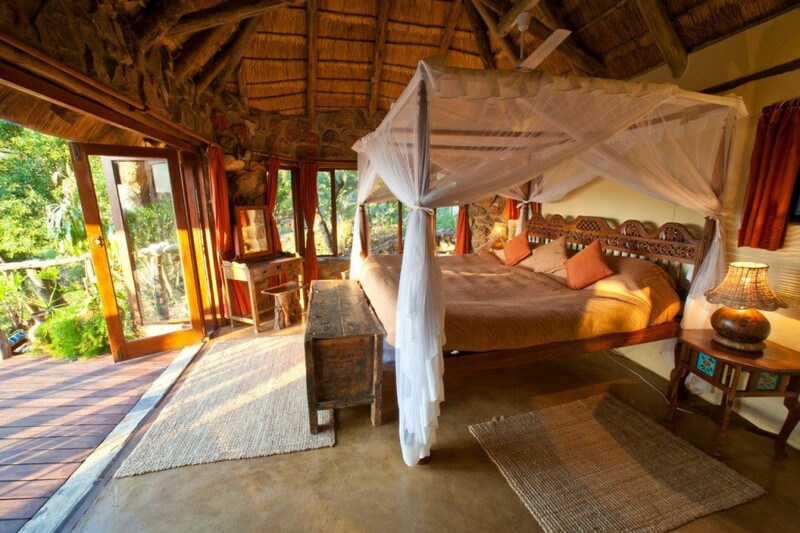 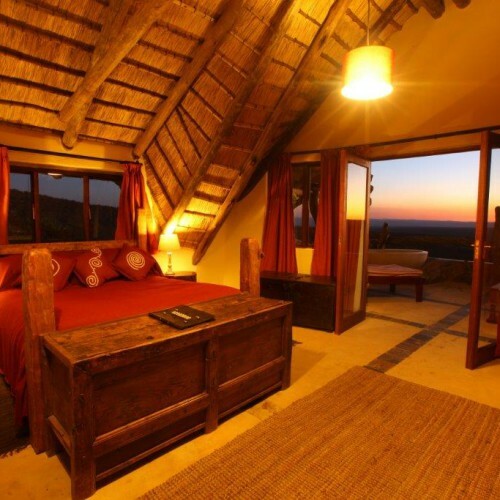 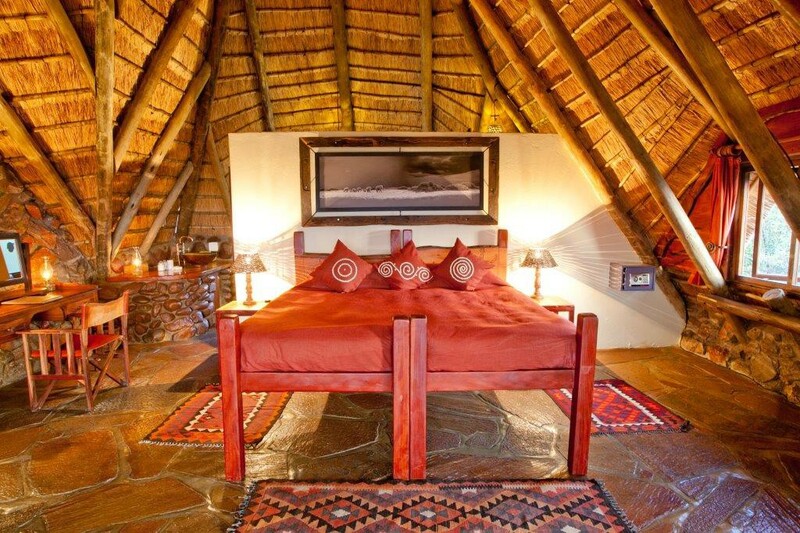 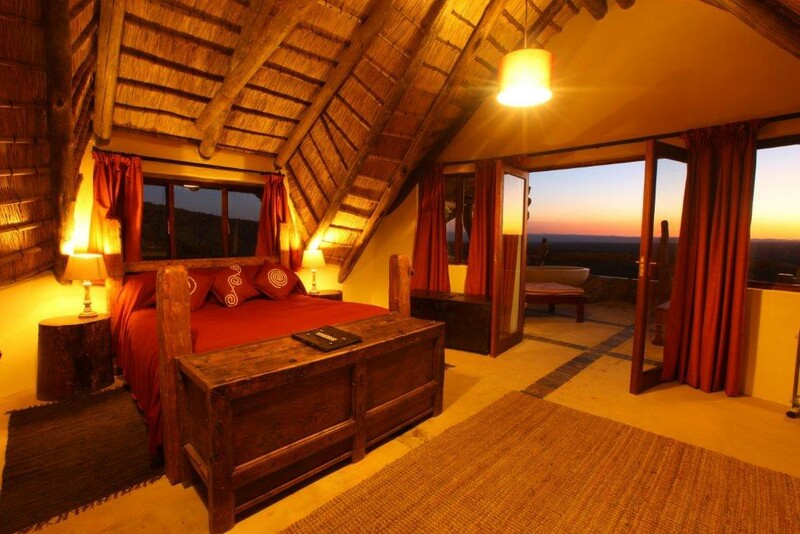 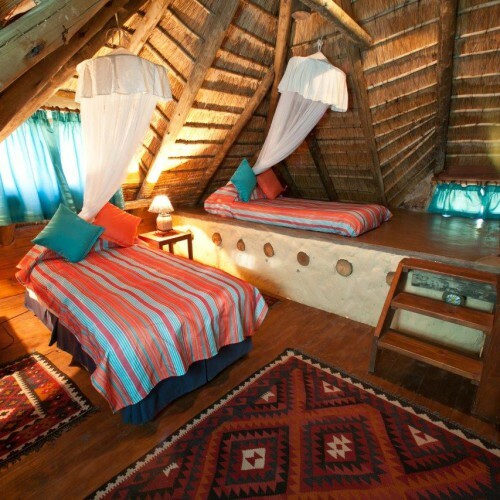 This room shares a bathroom with the loft bedroom, nestled under the thatched roof, which is perfect for children. 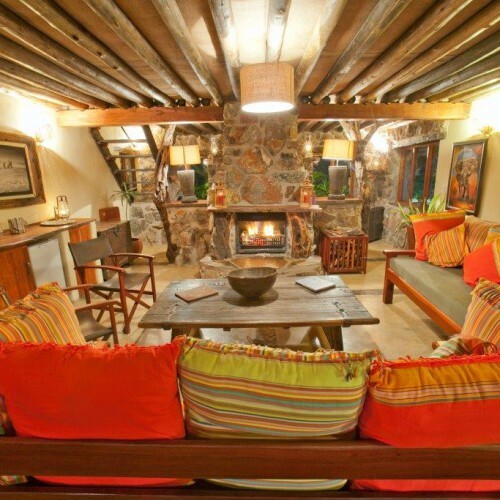 This cottage has a large sitting room, with open fire place and dining area, opening onto a decked balcony with views over the valley. 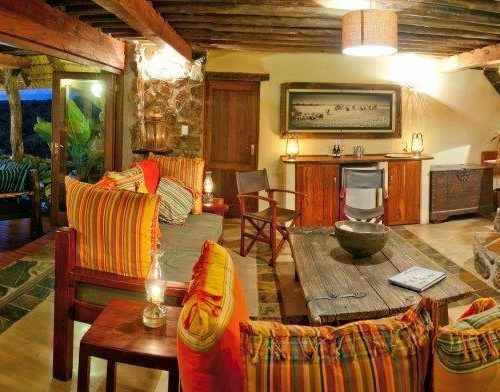 There is a mini bar with tea and coffee making facilities in the lounge area. 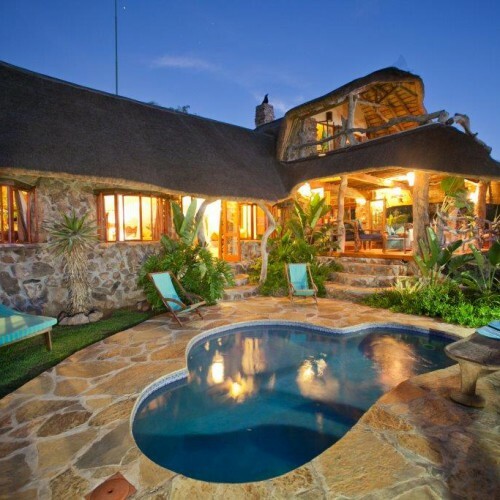 Family cottage is based on a rate for the whole cottage up to 5 people, extra beds are available at an additional cost. 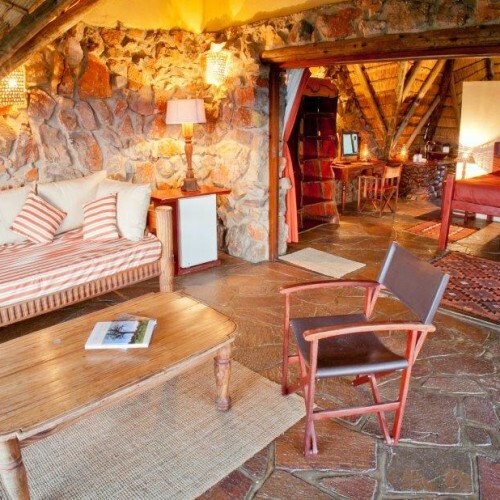 Superior Standard room – Located above the main lodge, this delightfully appointed room has some of the best views the lodge has to offer, and it can be booked as either a twin or double room. 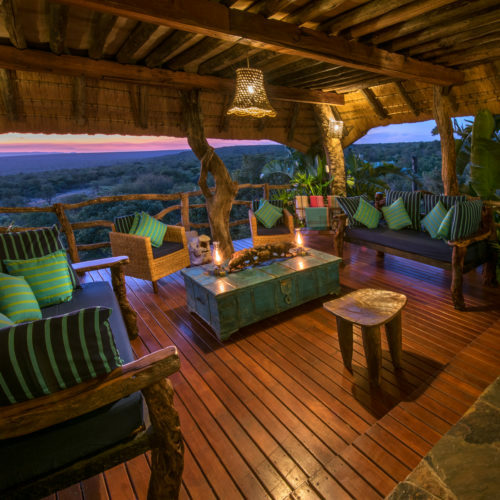 It has an en-suite bathroom and spacious outside balcony with carved day bed the perfect place to chill out in the heat of the day. 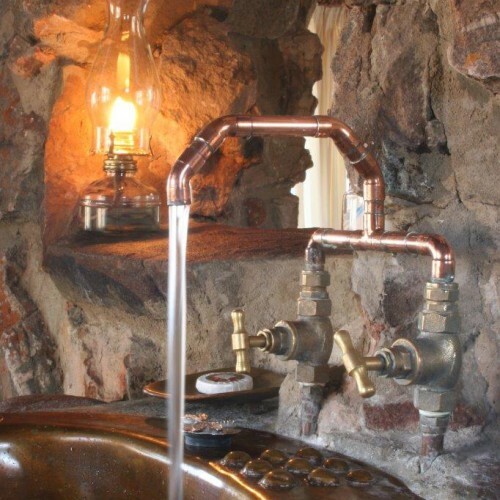 There is a mini bar with tea and coffee making facilities. 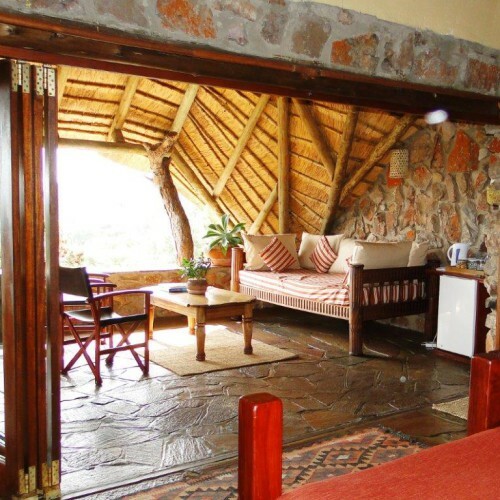 For those with older children, this room is ideal in conjunction with Lookout as another option to family cottage or Worldsview.